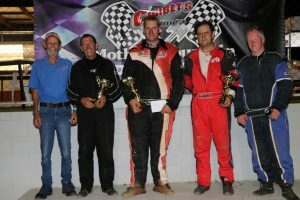 Corbet’s Group Mothar Mountain Speedway produced another night of thrilling action on Saturday December 1; with the running of the Coolum Beach Getaway Resort Street Stock City of Gympie Title. A very healthy field of competitors had entered for the event and the racing from the very beginning was nothing short of spectacular. In what was stifling heat, the track held up well and the Street Stocks turned it on. The six heats produced five separate winners; all of which added up to a very interesting feature final. Heat 1. Robert Trapp (1st); Darren Ciesiolka (2nd); Travis Hutchison (3rd). Heat 2. Ryan Kahler (1st); David Priddy (2nd); Wade Murray (3rd). Heat 3. Rick Cunning (1st); Dylan Jarmen (2nd); Wade Murray (3rd). Heat 4. Robert Trapp (1st); Darren Ciesiolka (2nd); Brandon Hough (3rd). Heat 5. Peter Thompson (1st); Travis Hutchison (2nd); Darren Ciesiolka (3rd). Heat 6. 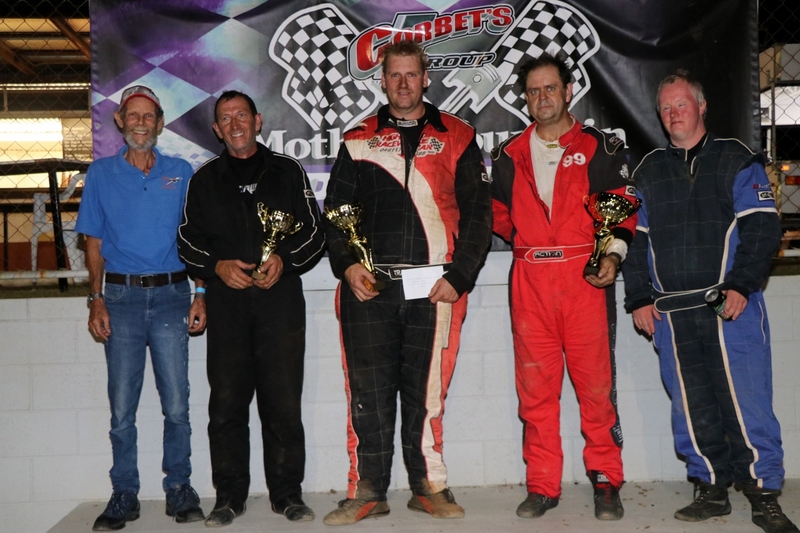 Brandon Hough (1st); Rick Cunning (2nd); Dion Wood (3rd). The 30 lap (2 by 15 laps each way) feature final took a couple of attempts to eventually get underway. Rick Cunning was involved in one of the early stoppages, which meant that he had to then come from the rear. Engine heating problems bought an early end to his title challenge. Greg Langton was also involved in one of the early problems. Thanks to some great race tape panel repair work from infield officials and the half race stoppage to send cars the other way; Greg was able to battle on to eventually come home a very creditable third in the title. Peter Thompson battled car issues all through the night. His car for the final was a combination of parts from both Thompson Racing cars that had entered for the title. He led the race for some time; but, was eventually relegated to second at the conclusion of the title. He and his passenger were more than happy with the result. Travis Hutchison was near the head during all of his heat races. He freely admitted that the half race stoppage and turn around worked perfectly for him. He was very happy to receive his first trophy in the Street Stock class. A big thank you must go to Coolum Beach Getaway Resort for their continued support of the Street Stock division in particular and Corbet’s Group Mothar Mountain Speedway in general. Coolum Beach Getaway Resort Street Stock City of Gympie Title trophy presentation. Peter Thompson (2nd) Rodney Cornelison (passenger).